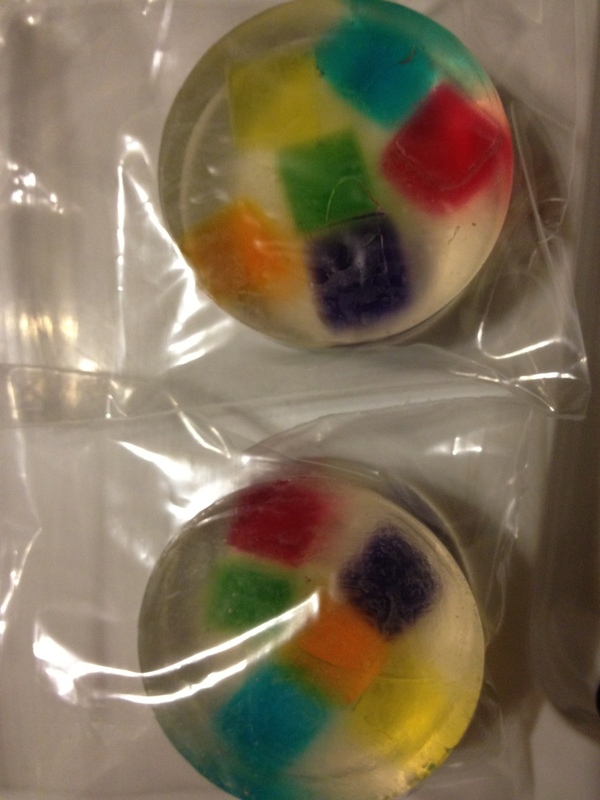 I got an order to make fruity, rainbow soaps like my “surprise” ones, for birthday party favors. I think these turned out pretty well, although I’m disappointed by the yellow embeds. I had two helpers that day that helped pour (first time pouring for my new helper). They wrinkled their nose at the scent until I unmolded a botched one, cut it in half, and said they could take them. Turns out these soaps are “pretty cool” then 🙂 I think a clear ballerina filled with rainbow embeds might be a nice touch for the special young lady who currently loves rainbows and is so sweetly feminine. I’m going to have fun experimenting. In the meantime my helpers think the jewel tone embeds are “amazing”. Tweens cut you down without a thought, but boy they can sure give a great boost the rest of the time. I still need to try the root beer float embed soaps *grin* We’ll see if they’ll ever make it to the shelf to sell, since all of my root beer products tend to disappear between my mom, husband, self, and helpers *grin* What a compliment!